IT’S turned midnight and stars are burning. There’s a smell of autumn in the grass and draughts stir the flysheet. The summer isn’t quite dead but it’s fading. In the deep shades of night, lying still as a stone in a sleeping bag with my eyes to the stars, it’s easy to imagine the first fall of leaves and the bite of frost . . . If I’m giving you the impression I’m camping on a star-lit hilltop or in a secluded dip between wild ridges then I apologise. I’m in the back garden drinking gin and tonic in a tent purchased last week at a garden centre in the village of Blofield, near Norwich, where my wife was born. Tonight I’m back in the North-East observing bright stars. I don’t know much about astronomy but I think one of those distant heavenly sparks is Seamus Heaney. 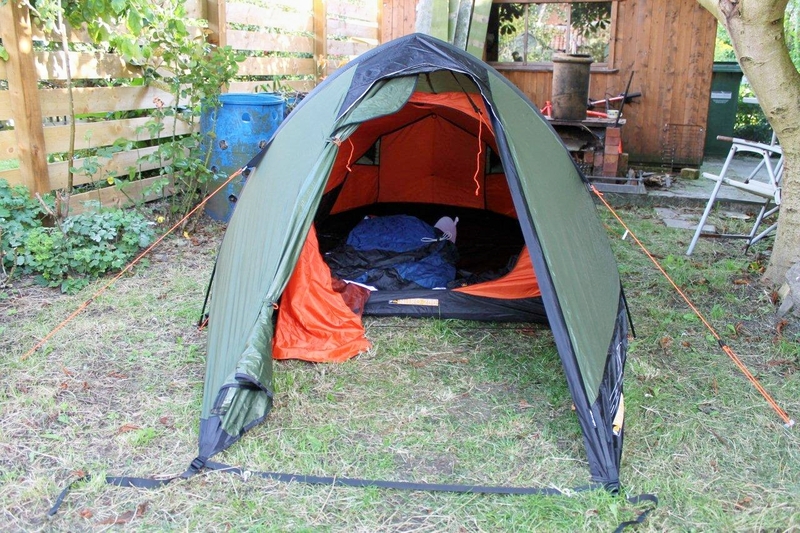 So we were walking though this garden centre, which has a large camping and leisure section, when I was attracted – like a moth to a heavenly spark – to a Vango Force Ten Nitro 200 two-man backpacking tent reduced from a stupid amount of cash to £199. Certain people have since argued that £199 is still a stupid amount of cash. There was even a demonstration model pitched in a field along with all manner of party, barbecue, beach, picnic and inflatable tents that people like me could crawl into and inspect. So I bought it on impulse. I don’t do many things on impulse, so I’m pretty chuffed. And if I’m giving you the impression that this might turn into a gear review – it isn’t. Gear, so far as I’m concerned, is one of the mysteries of life, which probably goes a long way to explaining why so many of my expeditions end in disappointment. But I’ll tell you this. I had no trouble pitching it. Except while I was poring over the instructions one of the chickens escaped from its pen – Scary Mary the white leghorn – and declined to be captured. 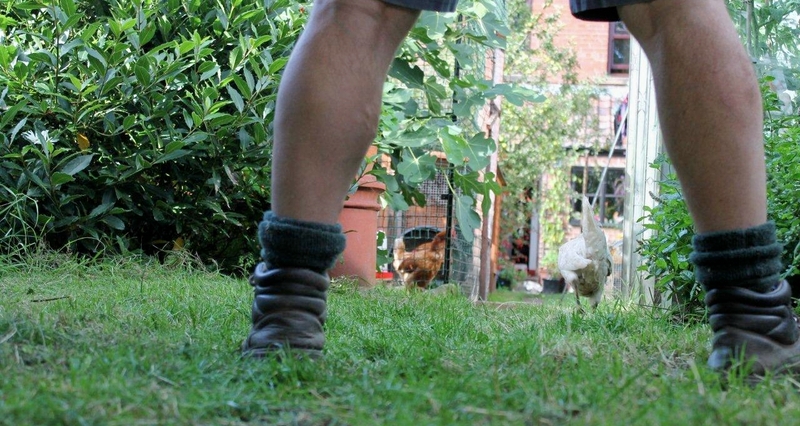 Chickens always run in the the wrong direction when you’re trying to herd them. Are they thicker than us or on a higher cerebral plain? That’s one I intend to think about. Another thing I’ll mention is that the five alloy pegs that secure the guy ropes have an “X” cross-section. They are undoubtedly very effective in a force ten gale, but if you step on one in your stocking feet you feel you’ve been nailed to a cross. I’m not saying they inflict blinding pain, but I was expecting to open my tightly-screwed eyes to see John Wayne in a centurion’s outfit standing by the greenhouse. Anyway, Seamus Heaney died a few days ago so I was rereading his translation of Beowulf when I turned off the lamp to gaze at the stars. Back in the mid-1990s, my wife and I had the honour of sitting in a packed auditorium at the University of East Anglia (there’s an unhappy coincidence) listening to a Heaney recital. Heaney was introduced by Andrew Motion, who shortly afterwards was elevated to the position of Poet Laureate. Funny how things happen in Norwich. Another reason I’m camping in the garden is because the house is full of strange people – including grandchild No 2 who is only a fortnight old. I’m still trying to get my head around this. Little blokes pop into the world at one end, blossom, make their mark, then grow into old men and pop out at the other. So I raise my gin and tonic to the bright star that looks like it should be called Seamus Heaney. David Frost’s probably up there too, and David Jacobs. And I toast the conveyor belt of life and the human race. Because despite all the international doom and gloom, to produce such gifted and enchanting people we must be doing something right. 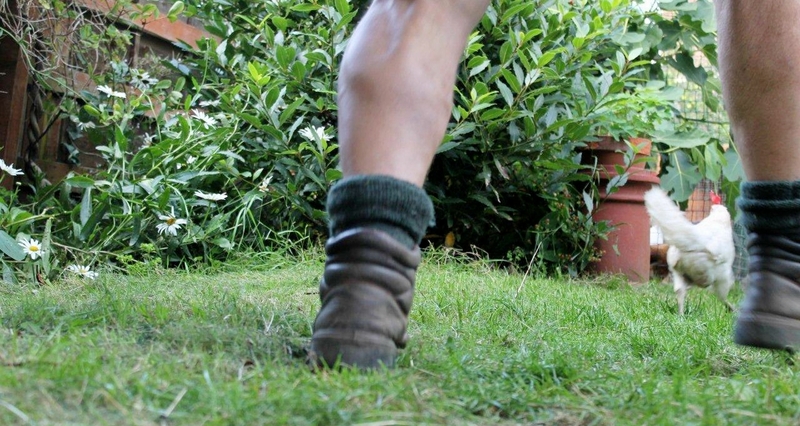 This entry was posted in Beowulf, Camping, Death, Environment, Hiking, Life, Norfolk Broads, Seamus Heaney, Shipping Forecast, Walking, Writing and tagged outdoors. Bookmark the permalink. Ha ha. Sorry about that, BG. I meant to see if it was on YouTube but never got round to it. Didn’t it go something like: “Trulee, he was the son of Gawd.” All I remember is that it brought a reasonably good film crashing to the ground. I shall now follow your link. “Trulee this man was the son of Gawd.” Can’t beat Big John. But I prefer The Quiet Man every time. Hello Mrs P. There’s a line in the film Brassed Off about God always taking the wrong people but I can’t bring it to mind at the moment. Research needed. 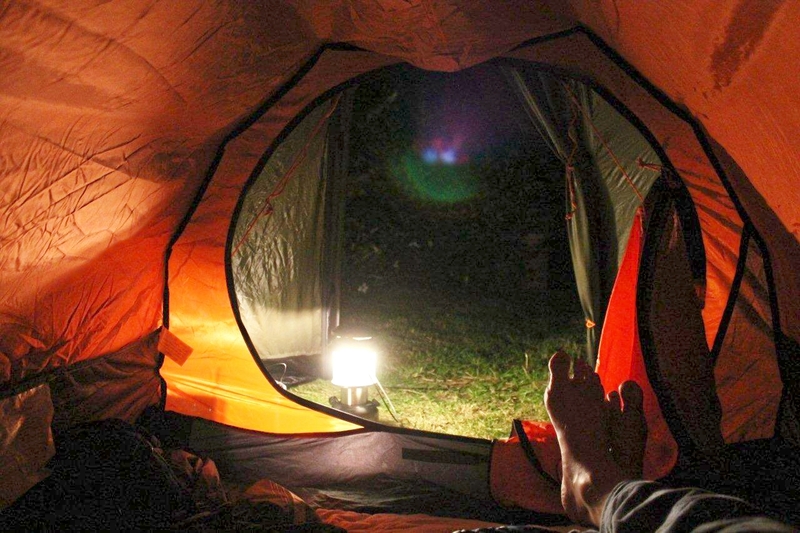 Btw the tent looks a wonderful refuge to zip out the world. It is, by golly. And the best thing about it is the door to the inner part is circular, which adds to the snugness factor. Like a Hobbit hole. An impulse buy! You are too honest, perhaps you should haved used the justification of having visitors staying to get the new tent, or perhaps the increasingly popular, I needed a lighter one? 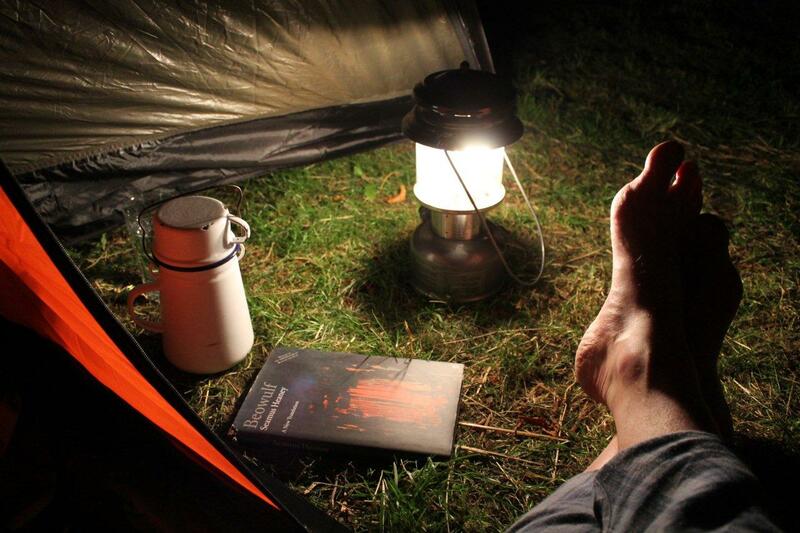 Are you planning some overnighters in the hills soon? Scary Mary, sounds like a grand name for a chicken. I sure am planning some overnighters. I’m not saying what the objective is, David, in case it all ends in tears, but I shall be passing through Teesdale one day next week, with a bit of luck. Keep your eyes peeled. The tent’s actually slightly heavier than my old Bob Saunders two-man, but it’s much more comfortable, vastly more roomy and I can roll over without rubbing the inner against the flysheet and soaking everything with condensation. I’m expecting great things of it. There’s even room in the porch for Scary Mary. Don’t you be straying from the straight and narrow, Carol. I think you’re wild enough as it is! Congratulations on your new little grandchild and tent in said order. I am looking forward to see more children attend to your mountain tours. 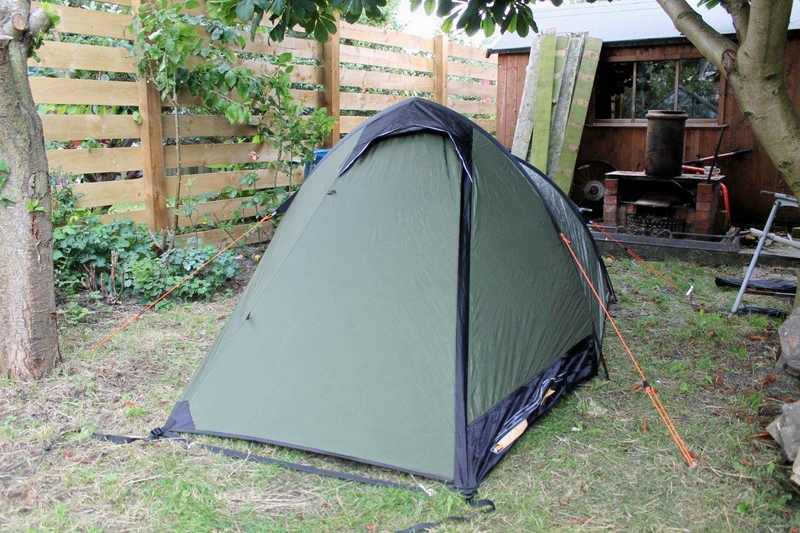 The tent looks great, and now when I read that it has a built hobbithole, I think the 199 £ is well spent. Hej, Hanna. Thank you for your kind words. The tent will be big enough to accommodate me and one grandchild with gear, and I took that into consideration when buying it. Two grandchildren would, I think, be too much for me to handle. One at a time is more than sufficient, but I hope that both of them will eventually come to appreciate the great outdoors. My granddaughter, Lyla, loves our little exploratory walks and can’t wait to go camping. She’s just a bit young yet at 3.5 years. I shall leave Scary Mary at home. Too many foxes in Teesdale anyway – not to mention the legendary Durham puma. But that’s another story. That looks an excellent tent, and I’m not surprised you were persuaded to buy it. I loved your intro – I really did think you were going all kind of Wordsworth on us – but then I’m pretty sure Wordsworth didn’t bother chasing hens. Scary Mary sounds more than capable of looking after herself, but the photo-journalism of the chase is excellent! I love pondering on the stars too, and they are what we’re made of, after all (so I’m told!) Congratulations on your new grandchild! Hi Jo. Sorry about the delay in acknowledging your comment – I’ve been away in the hills. The tent IS excellent, by the way. I’ve just had two high-altitude nights in rough conditions. Well, one night was rough anyway. I didn’t ponder over any stars this time because it was too damn cold to poke my head out. The grandchild is doing fine, thanks. He’s going to be a sturdy hillwalker. I’ve made my mind up! Good tent that. I had a good look at one when I was out in the Cairngorms with Terrybnd. He has got one and looks decent. Ah, thanks for that Mark. I appreciate an expert opinion. 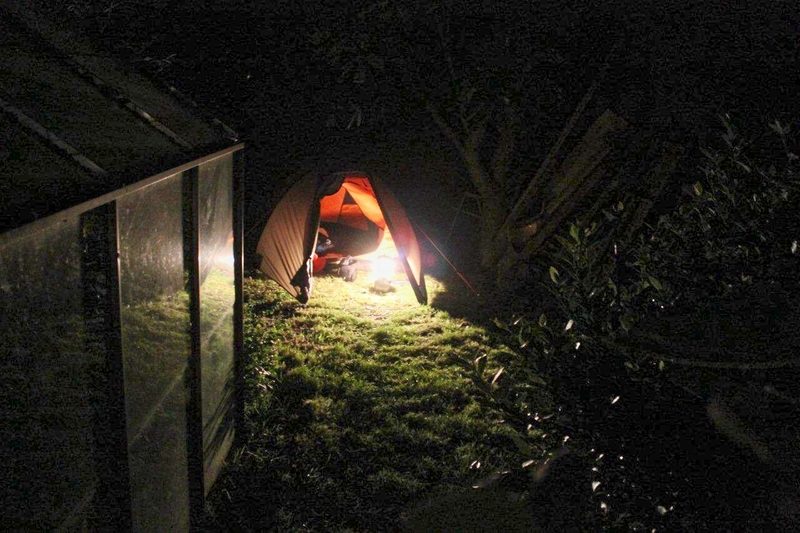 So far I’ve had two wild camping nights and two garden camping nights in it and I can’t find a fault. Condensation is not a problem; it’s roomy and comfortable; plenty of space in the porch for cooking in bad weather; very easy to pitch once you’ve got your head around it; and not bad in the weight department. I’ve reached the limits of my technical know-how now. Love this blog! 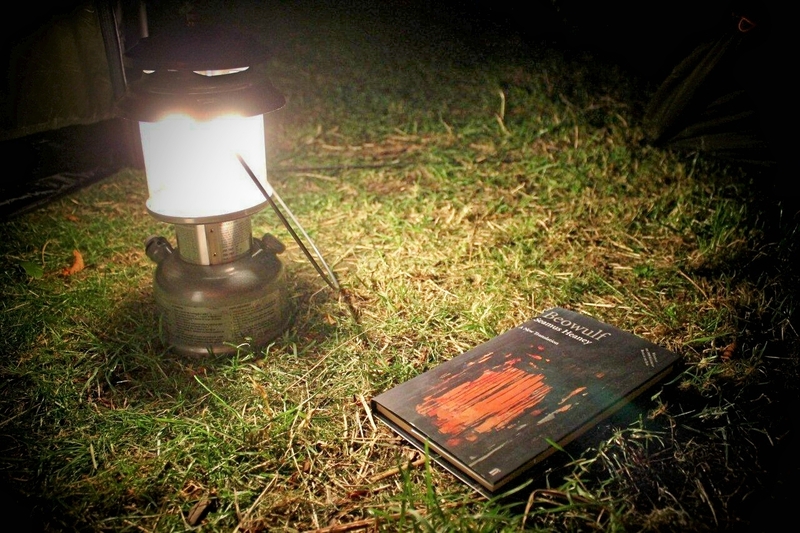 And love that you camped in the garden! I haven’t done that since I was about 10. 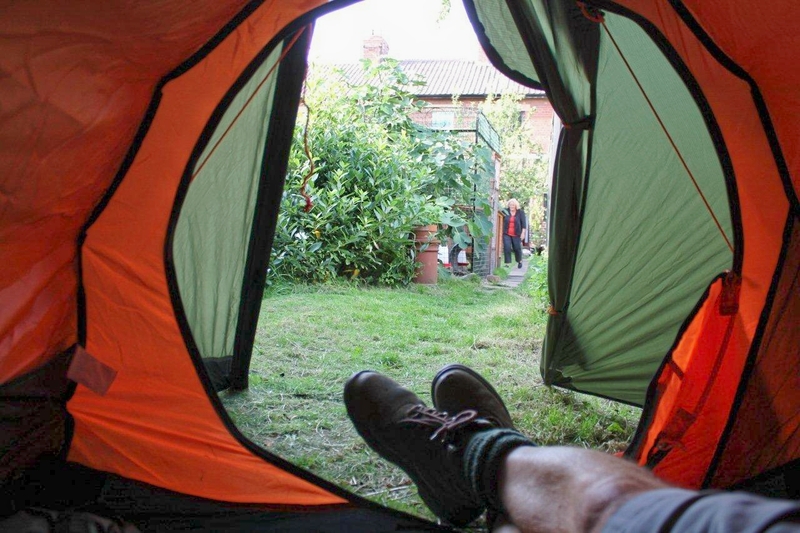 Although when i purchased my Tadpole tent about 5 years ago i did erect it in the living room (it was lashing it down outside) and sat and watched tv and had my tea in it. 🙂 Not quite the same. Hi Tinkerbell. That sounds great. When I was a kid I used to make a tent by throwing a sheet over two chairs. I think camping’s in the blood. That was a lovely piece of writing by you, which I really enjoyed. I’ll look forward to looking in on your blogs on a regular basis from now on. Thanks, Ian. That’s the nicest thing anybody has said for a long time. It makes all the work worthwhile.